Many performers say they caught the bug young. 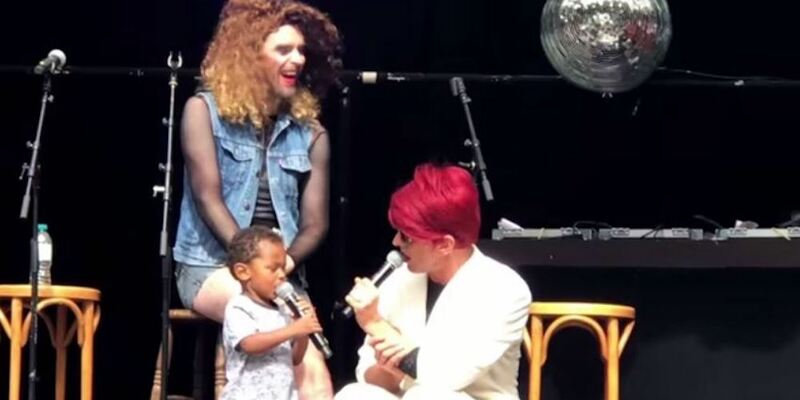 But two-year-old Giovanni — and, yes, he’s just got one name, like Cher — decided he’d do something about it. At London’s yearly drag event, The Glory: Apocalipstick, Giovanni climbed up on stage. He promptly upstaged the host, Jonny Woo. Woo started interviewing the young star, though the child’s voice was a bit difficult to understand. Knowing his limitations, however, Giovanni pivoted to play to his strengths: singing. Giovanni starts singing a tuneless song, and after a verse, Woo joins in. Pretty soon, the onstage keyboardist joins and it turns into a regular jam session. 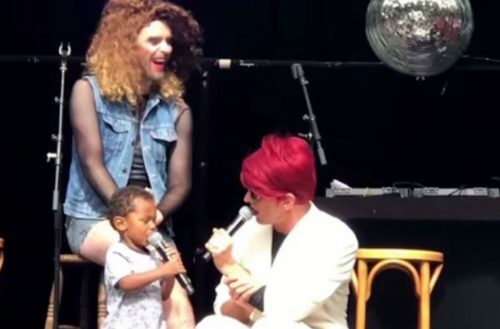 It might seem strange for a child to wander on stage at a drag show — even though it’s happened before! But in this case, this particular show is designed to be family-friendly. In fact, children are often invited up on stage. However Giovanni, like any true star, didn’t wait to be asked. After a while onstange, his mother came to collect him. But Giovanni wasn’t done and kept singing until his song was finished. He seemed to have a good time — as she picked up her son, Giovanni jumped and skipped along. Though Giovanni’s stage time only amounted to about three-and-a-half minutes, he was a hit. The crowd cheered and applauded as Woo thanked him by joking Giovanni was actually 26. “This was a real impromptu moment and the boy was literally following his instinct as to what he wanted to do, or where he felt attracted to. “It’s like a gut instinct to join in, without prejudice, just a desire to be part of it. I felt a responsibility to encourage and not dissuade but also have fun and make the audience feel at ease. “It was a really joyous precious moment which I felt privileged to be part of and was all about performance and play. It was a fun moment and brings tears to my eye when I watch it back.